Agile, practical and trendy - just a few words which can be used to describe the new Citroën C3 which we have available to order here at Motorparks today. There's so much space inside this vehicle to make it appealing to families, while the fact it's a compact hatchback means it can handle city driving with exceptional ease. The new Citroën C3, the fashionable hatchback available now from Motorparks Citroën and Oldham Motors Citroën. The latest-generation versions of PureTech petrol and BlueHDi Diesel engines have been added to the new Citroën C3, allowing the compact hatchback to boast an economical and efficient setup. With the vehicle measuring in at under four metres in length, you'll also quickly notice that this car is incredibly easy to handle once you're behind the wheel. 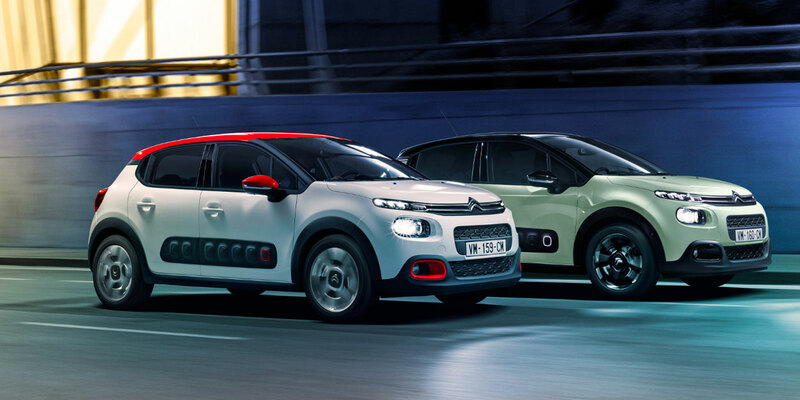 The new Citroën C3 instantly stands out from the crowd thanks to its unique shape. Prepare to be even more amazed once you step behind the wheel of this compact hatchback too, as the cabin has been expertly designed around your wellbeing. A powerful and energetic stance is likely to be the first thing you notice when introduced to the new C3, made possible by its charismatic front face and use of generous curves. Adding to the car's character is a series of smooth lines, while a floating roof design that is supported with the use of black windscreen pillars gives the exterior of the vehicle a calm, confident and serene look. You are certainly encouraged to feel relaxed while aboard the new C3. The car's seats are unbelievably comfortable and its panoramic sunroof bathes both the driver and passengers in so much natural light. There are so many clever storage compartments to be found throughout the vehicle's cabin as well, while its boot volume measures in at close to 300 litres and means you should never need to compromise on luggage space. Fashionable technology is a term that has been coined by Citroën when describing the gadgets found within its new C3, highlighted by ConnectedCAM Citroën® - a connected HD camera that enables drivers to safely film scenery, locations and cityscapes which they pass while behind the wheel. Everything in the C3 from a lane warning departure system to a reversing camera and active safety brake will also be working to make getting from A to B a lot less stressful, not to mention a speed limit sign recognition and recommendation feature ensuring you always keep on the right side of the law. You certainly won't be short on personalisation options if you choose to make the new Citroën your next set of wheels. For example, you can choose between bi-tone or mono-tone styling, an interior ambience that is either more cosy or more refined, and even the car being manufactured with or without its Airbump® panels. Make an enquiry online about the many other ways that this compact hatchback can be personalised, as well as to find out much more about this vehicle. Alternatively, you can head along to our Oldham Citroën dealership in Greater Manchester to check out the car in person.